Day after day the sun beats down unblinking from a cloudless, rainless, azure sky. Grass has long since stopped growing and crunches brownly underfoot. The garden quietly fries and the fields are barren. We continue to move sheep from field to field as we imagine we see a tiny haze of green appear. Each day ewes and lambs follow me to the gate baaing to come through in case the grass really is greener on the other side but, alas, it is not. Day after day we look at the local weather forecast on the internet praying for rain; tomorrow and tomorrow it teases, only to drift away day after day like a mirage on the screen. Spring water still fills troughs in the fields and the pond pumps water from a trickling stream but for how much longer, I wonder. Its weeks since it last rained and we should be so happy to have a beautiful summer at last. Instead we’re pondering the future price of hay and wondering if there will be any available for next winter. The whole valley has a brownish yellow haze. We are all in the same predicament. A garden stroll completed, an afternoon-long queue formed for cream teas! We set tables and chairs in the now tidy farmyard amongst tubs of lavender and daisies. Plate after plate of scones, clotted cream and strawberry jam flew out of our make shift kitchen. Will, from the wonderful The Anchor stone Cafe in the village, had generously baked piles and piles of gloriously light golden scones. 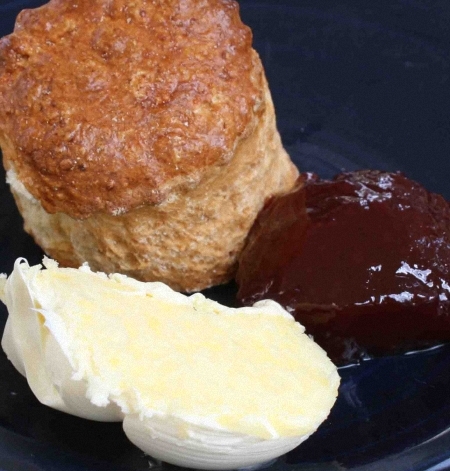 Of course the cream debate re-emerged; in Devon, jam then cream, in Cornwall, cream then jam or is that the other way round? 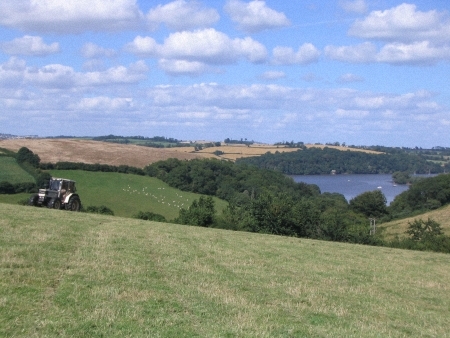 My roots are Devonshire, my husband, a Cornishman; the debate continues! But the teas were a triumph! Good friends pitched in to help; big thank you to Maggie, Edith, Debbie, Bee. Stephen and Callum. Peter, my neighbouring professional horticulturist acted as my plant memory for the afternoon giving us time to walked around talking to our visitors doing our best to answer so many questions about house and garden; we explained how the garden had gradually evolved from nothing over the last twenty eight years, about the origins of the house built in 1767, recounted the rumour that the Rev Francis Lyte wrote ‘Abide With Me’ during his brief tenure here. I wonder if he did! We had two glorious afternoons after weeks of hard work and, best of all, thanks to the generosity of all our visitors, we were able to make a big donation to the NGS for Marie Curie, McMillan and other charities supported by NGS. A big team effort, thanks to everyone. 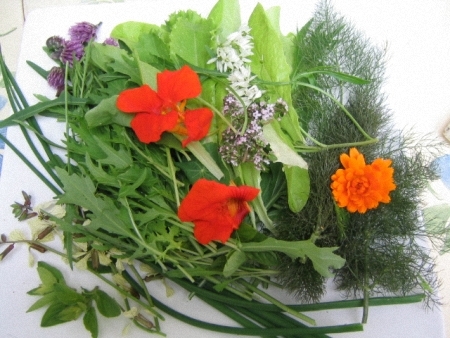 As vegetables burst forth in the vegetable garden in the relentless heat and the house fills with summer guests, I seem to have been swept up once more in a cooking whirlwind. Summer days lead me back to my much loved Elisabeth David, Jane Grigson and the River Cafe books. 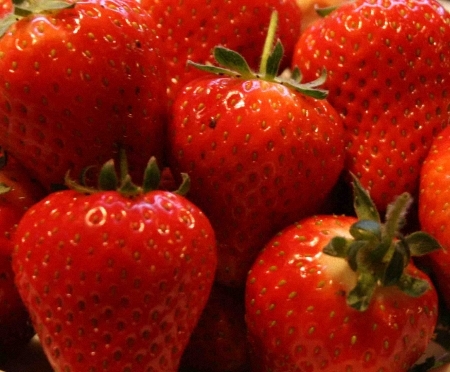 As a result of the dry weather the strawberry crop is somewhat over whelming. I’m pondering how to use them having found in the past that freezing is not a success. So jam will be made and I will try a strawberry and rhubarb crumble. A good friend tells me it’s delicious. Broad beans abound, courgettes too. 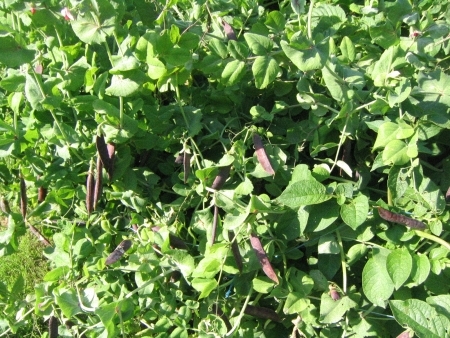 The pea plants looked so small and feeble but have somehow still produced a bumper crop. I’m not sure where all the slugs have gone this year, maybe they hate the drought too. The result is the brassicas are doing really well, Cavolo Nero majestic already. the pea crop looked small but…. And the sweet peas are so long stemmed and sweet smelling, a tribute to my daughters delightful neighbour who died recently and who told me to plant them in October. 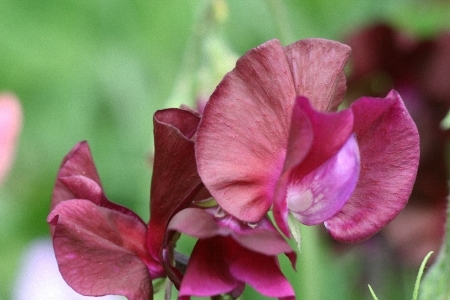 I shall always think of dear Miss Vaisey now when I pick sweet peas. I baked a huge Polenta Cake for Edith’s League of Friends. It looked so inviting it was hard to give away! I whizzed up 450 grams of unsalted butter with 450 of caster sugar, then stirred in 450 of ground almonds, a dash of vanilla essence, 6 eggs and the zest and juice of a lemon. A small teaspoon of baking powder, a good pinch of salt and, of course, 225grams of polenta completed the mix. It went into a 30 centimetre oiled and floured cake tin , then into the oven at 160C for about 45 minutes till firm and golden; very delicious! Some friends from childhood arrived for a long weekend. We were fourteen for dinner so I “butterflied” a large leg of our own Whiteface Dartmoor lamb and served it pink and warm with steamed samphire, lemon, mint and olive oil; a delicious combination. I made a big Terrine of Pork and Chicken with crushed juniper berries, green peppercorns and fresh herbs from the garden. We had a salad of broad beans, roasted peppers and, a small personal triumph, my own baby carrots! A green salad from the garden, new potatoes with grilled artichoke and a big bowl of home made Aioli completed the feast. For pudding I made Fig Flan with some of last years figs. We had such a glut that I froze batches in vanilla syrup. I made a Kissel of blackcurrants adding lots of strawberries and served both, of course, with local clotted cream. Mince 5oo grams of belly of pork with 250 grams boneless chicken meat. Mix well adding 3 cloves of crushed garlic, 2 finely chopped shallots, a teaspoon of green peppercorns and 5 or 6 crushed juniper berries. Pour on a glass of red wine and allow to marinate. Line a pound loaf tin or similar shaped oven proof pie dish with streaky bacon. Take each rasher and stretch it with the back of a knife on the chopping board. Then line the dish so that each rasher covers the bottom and one side with the end hanging over the edge. Take half the minced meat and fill the dish halfway. Sprinkle with chopped herbs. Cut the remaining 250 grams of chicken into strips and place down the centre together with 100 grams of chicken livers. Add more herbs and cover with the rest of the minced meat. 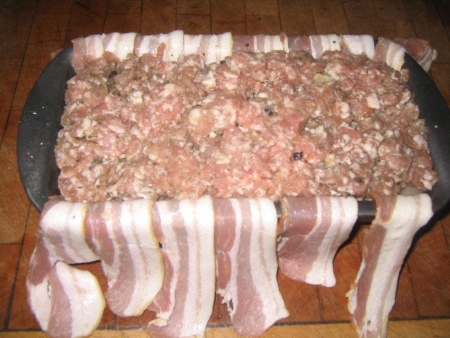 Press down gently and wrap the bacon over the top. 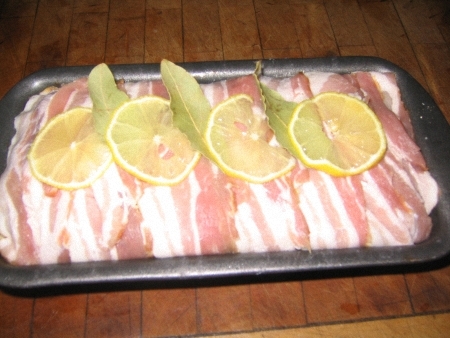 Decorate with lemon slices and a couple of bay leaves, cover with tin foil and place in a bain marie; a roasting tin, in other words, half filled with hot water. Place in a moderate oven for an hour and a half checking regularly and topping up water in the Bain Marie when necessary. To be sure it is cooked pierce with a long skewer, if the juice is clear the terrine is cooked, if it is still pink, cook a little more. When you are confident it is cooked take it out of the oven and lift carefully from the bain marie. 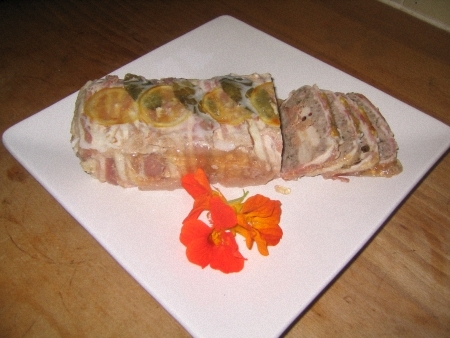 Tip water out and return the cooked terrine to the dish. Put a heavy weight on the top. I use a brick and the weights from Granny’s old fashioned kitchen scales, but improvise. The juices will overflow a little. When the whole is quite cool, refrigerate. Serve with salad and new potatoes the next day. Line a metal 26cm flan ring with pastry. I buy lots of wonderful ready made pastry from a French supermarket in Brittany and put it in the freezer. Cover pastry with baking parchment and bake blind in a hot oven till golden and crisp. There’s nothing worse than a soggy bottomed flan; usually anaemic quiche! Leave to cool while you make custard of 50grams each of unsalted butter, icing sugar and ground almonds. Mix together with a large egg and a generous tablespoon of double cream. Spread the mixture onto the cool pastry base and arrange the figs in a neat circle, sprinkle with castor sugar and cook for twenty to thirty minutes in a moderate oven until the custard is set. Allow the flan to cool. Melt a tablespoon of redcurrant jelly and “paint” the cool plan and pastry with the shiny glaze. Serve with cream the same day. 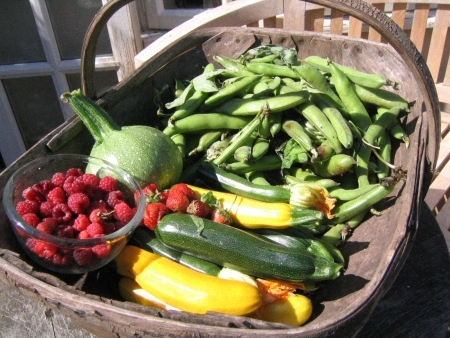 …just a trug full of delights!